Does fun in the sun for your or someone on your list involve time on the water, jumping wake and making waves? 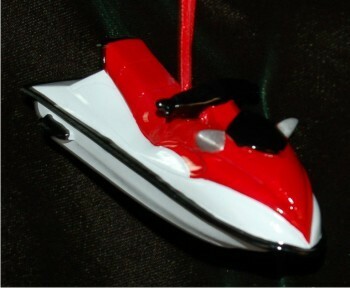 If so, the personal watercraft Christmas ornament personalized will be an instant hit for sure. It’s a personalized Christmas ornament, so we’ll customize it by hand with the details you include to create a Christmas gift or addition to your own tree that is truly unique. Keep warm memories of summertime fun alive during the cold holiday season with a splash of action for the tree, the personal watercraft ornament personalized to be appreciated in years to come.